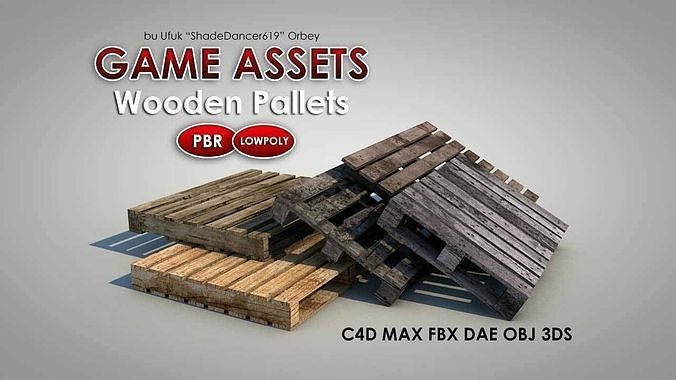 These are high quality and nice textured dirty pallet models. If you want to triangulate them for playing games polygon counts never disturb the game engine. Even if they have triangles the model size is still very low. You can find some different formats and archives in model packet. Every one has its own job to be used or modified. This file has 5 pallet objects with textured parts of them. They were not connected or baked. This is your modification file. You can change the textures, sizes, counts or general shape of models. Then you may bake and texture all of these. These are the baked files. 5 single objects placed here but no seperated parts available. UV maps are ready to use with all PBR capabilities. 25 PBR UV maps (5 for each object) and 5 wood textures placed in this archive. Wood textures are using by the PLTsource.C4D and others for baked files.